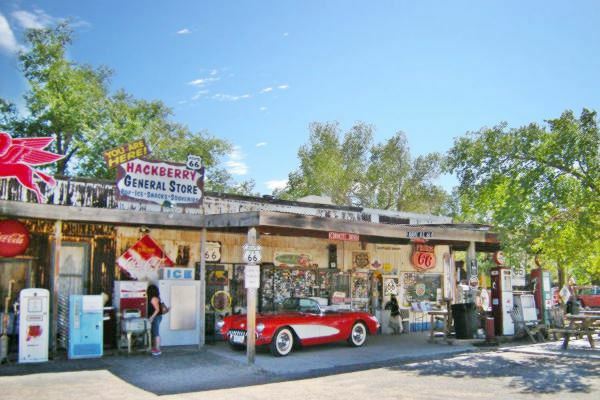 Hackberry is known a small village best known for the Hackberry General Store (The Northside Grocery). Elevation 3,583 ft (1.092 m). Population 68 (2010). 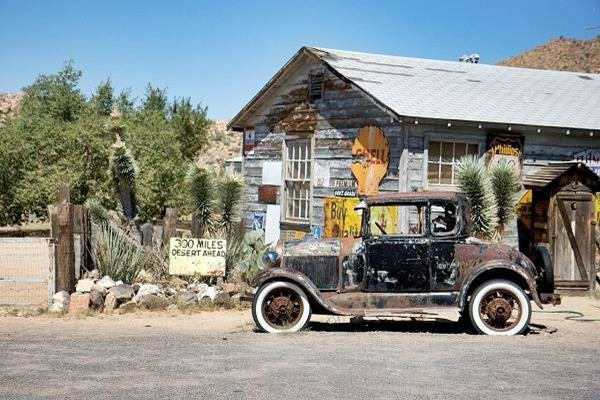 Hackberry is a tiny village in central Mohave County, on Route 66 in the northwestern region of Arizona. (Map of Hackberry). For the prehistoric and Spanish - Mexican history of this area, check our Peach Springs page. In 1848, after defeating Mexico, the U.S. incorporated this territory as New Mexico (later it split Arizona as a separate territory). In 1851 the area was explored by Captain Lorenzo Sitgreaves. He was followed six years later by Lt. Edward Fitzgerald Beale (1822-1893) who was commissioned with opening and surveying a wagon road along the 35th parallel from Fort Smith in Arkansas to California. Beale passed through Hackberry and named the spot "Garden Spring". His route was used by many settlers en route to California and one of them, Charles Cummings, established a ranch here in the 1870s. Shortly after, silver was discovered by Jim Music (1875) and the community grew. The post office opened in 1878. The mine was named Hackberry after a Hackberry tree which grew beside a spring on the hill where the mine was located. This bush can grow up to 20 ft. high. It is a member of the Elm family. It grows in canyons, washes and the desert but is more frequent close to water sources. Its yellow-orange fruits are eaten by the wildlife and were a staple in the Native Americans' diet. When the the Atlantic & Pacific Railroad (later the Atchison Topeka and Santa Fe Railroad laid its tracks through the area in 1883, it built a station and named after the Hackberry mine. The National Old Trails highway (N.O.T.) was built in the 1910s through the village, which was sustained mainly by a few small mines and ranches, however, by 1919 the mine had exhausted the silver ore and closed. 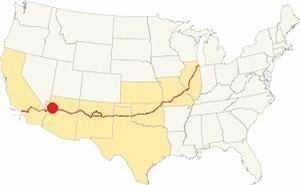 It was not until Route 66 was aligned along the N.O.T. in 1926 that traffic and new business reached the area. Service stations opened and the Hackberry General Store (The Northside Grocery) opened to cater to travelers. 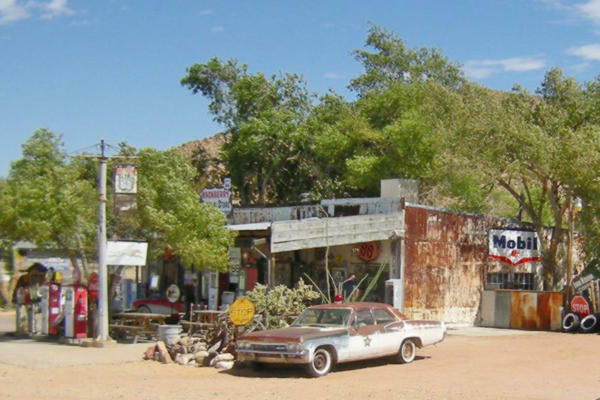 Business declined after 1979, when Route 66 between Kingman and Seligman was bypassed by I-40. Hackberry is located in a dry region with a "cold semi-arid climate". Its altitude gives it colder winters and cooler summers than those in the neighboring desert area closer to the (lower) Colorado River. Snow can dust the area ocassionally with around 3.7 inches (9.4 cm) yearly. Rainfall takes place 37 days per year, with 19.3 in. of rain (263 mm), with April, May and June being the driest months and August the wettest. Average temperatures during the year: summer high (Jul) 97.8°F (36.6°C) , summer low 67.2°F (19.6°C). Winter high (Jan) 55.9°F (13.3°C), winter low 31.1°F (-0.5°C). As the town lies to the west of the Rocky Montains there are virtually no tornados in Hackberry. Tornado Risk: read more about Tornado Risk along Route66. Check out Hackberry on our Route 66 Map of Arizona, with the complete alignment and all the towns along it. A very small village at the foot of Peackock Mountain, with its world famous Hackberry General Store (The Northside Grocery). In 1946 Jack DeVere Rittenhouse drove along Route 66 collecting information which he included in his book "A Guide Book to Highway 66". It is a great reference for those who want to know what US 66 was like in those days. Rittenhouse wrote the following: "the town of Hackberry lies down in the valley across the railroad tracks. There are several large tanks in the town which contain the diesel oil used by the locomotives operating on the railroads through here. Along US 66 are 3 gas stations (one offering light repairs) and a lunchroom.". He does not mention anything else until Kingman, stating that the road leaft Crozier Canyon shortly after leaving Hackberry and ran "amazingly straight" along a "great plain" all the way into Kingman. Antares was merely a railroad siding in those days. The village of Hackberry lies to the southwest of Route 66, beyond the railroad. You can reach it from the junction located by the General Store on Route 66. It has a few scattered houses and dirt streets. If you are keen on the pre 1930s Route 66, here you can drive the existing section that begins at Hackberry Rd. to the east and ends 2 miles west of the town. The Store opened in 1934 on the new alignment of Route 66 that was built on the north side of the railroad and bypassed the small town. It had a Conoco gasoline station and remained in operation until the Interstate bypassed this section of Route 66 in 1978. Then it closed. Bob Waldmire opened it in 1992 as a souvenir shop and information center. He sold it in 1998 to the Pritchards. There is a lot to see when you visit the store. There are many vintage cars outside it, from the "good old days" of the Mother Road. The place is full of gadgets, signs, mementos, billboards and artifacts from the 1940s through the 1960s. It is a virtual journey through time to stop at the shop. The interior of the store has all kinds of Route 66 souvenirs so you can pick your choice. Read more at the Hackberry General Store website. 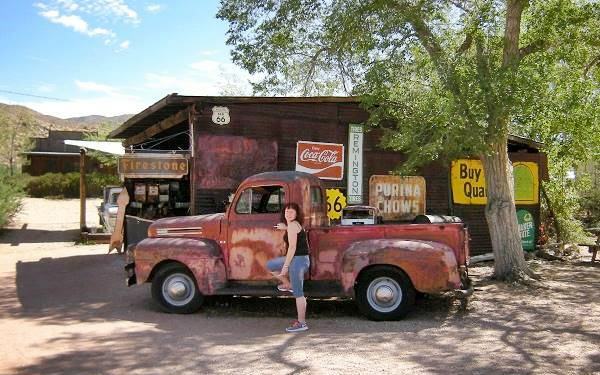 Head to the northwest along Route 66, the village of Antares is only 6 mi. away (Map with directions). From the Historic School in Valentine, Route 66 runs with a southwestern course and when it reaches the old Post Office of Valentine it takes a western direction. Take a left along Hackberry Rd. (south) cross the tracks and then head right (west) following Main Rd. all the way into Hackberry. 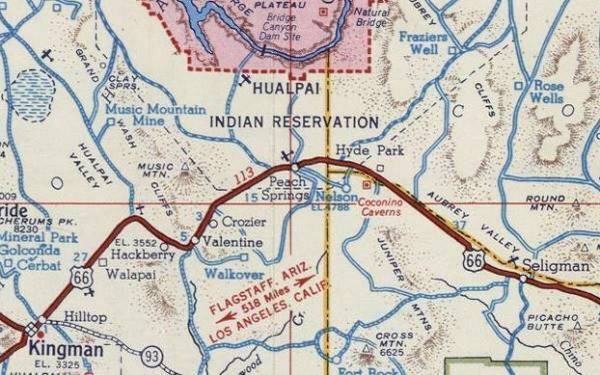 The road goes through the village and then crosses the railroad and meets Route 66 by Hackberry's General Store as shown in this map. The later (1937) the road was shortened, bypassing Hackberry altogether (current alignment) with a northwestern direction, parallel to the course of the railroad which skirted the Peackock mountains until reaching the Antares siding, where it turned sharply towards Kingman with a southwestern course. The map below from 1951 shows Hackberry. There are many outdoor places to enjoy nature close to Kingman, from neighboring Peach Springs you can visit the Grand Canyon and go rafting along the Colorado River at Diamond Creek or enjoy the Grand Canyon Caverns along Route 66. From Kingman you can visit Grand Canyon Skywalk and the Hualapai Mountain Park. You can also drive up to the Grand Canyon, from Williams.